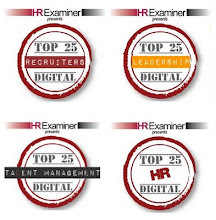 As I've being noting on this blog, I'm speaking a lot about talent management at the moment. Which is interesting, as it's a topic that I tend to avoid, mainly because I don't really know what it is. 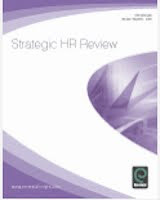 I know what HCM is - managing people to create human capital. 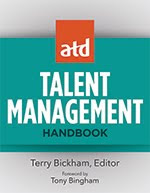 But even if talent management is managing people to create talent, that still leave me a bit unclear about what we're talking about. I've got ways around this of course, so if you do ask me to come and talk about talent, there's a number of insightful, provoking sessions I could give! 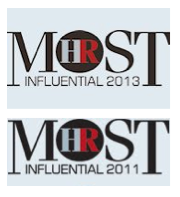 My second issue with talent management is that I challenge the prevailing approach within the UK and US at least to focus disproportionately on a small group of people who are supposed to have disproportionate impacts in an organisation (eg Ram Charan's suggestion that 2% of people have 98% of the impact on a business). I think the reason for differences in performance often have much more to do with the other people in the organisation than on those who are supposed to be talented themselves, and there's research to support that perspective too. 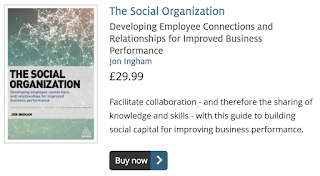 I started talking about that in my People Management webinar a couple of weeks ago and felt a bit odd dissing something I think I was probably meant to be supporting. 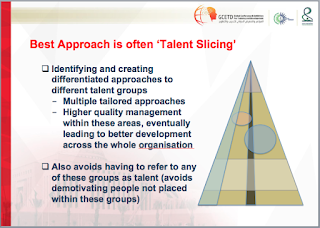 So before my session in Brussels last week I did a bit more thinking and came up with an idea called talent slicing. My suggestion here is that a focus on talent management is generally a good thing. Any workforce segmentation is good, and a segmentation around some group of people who have a particularly important role or some important attributes, makes particularly good sense. The issue is of course if this ends up as an exclusive approach in which it can do more damage through reduced social cohesion than it can through improvements in the talent / human capital provided by managing these small number of people in a different or better way. So why not see talent management as a successive series of developments slicing their way through the organisation, one 'talent' group at a time. Your executive team and their direct reports are important - great - slice. And emerging high potentials a few years after graduation - fine - another slice. What about another group of high performers in mid career grades - slice. And some technical or functional experts - engineers, analysts or sales people perhaps (depending upon your sector and organisation). But what about women returning from maternity / shared parental leave? And members of under represented groups? Etc, etc, etc. Slice, slice, slice. The advantage of this approach would be that it's tailored but not exclusive. It ensures people management can be adapted to the people who will get to use or be impacted by it. But it doesn't leave anybody out, even if some people benefit more early than others. And even if some of these probably never actually get talent sliced at least there's no deliberate policy to count them out. Plus as the slices progress across the organisation, with many of these involving not just differentiated but also generally better approaches to management, it's going to mean that the general management of people across the whole organisation slowly begins to improve too. Please note this isn't the same as using something like a 4 box / 9 box grid. Yes, this slices the organisation into multiple segments who can each be treated differently, but it's still only one group of real talent - those with high performance and high potential (or high attitudes). So it's still only one slice. 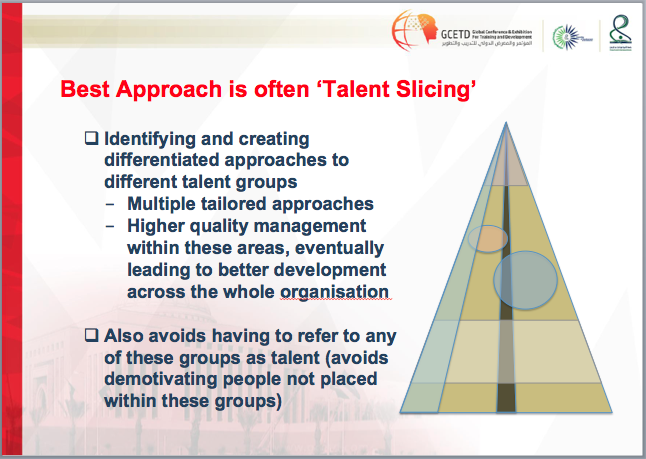 Additional slices would focus on other groups of talent, each focusing on the talent not on the people who aren't included in that slice. So each of the slices are made based upon something positive and important, which I think is a much more compelling concept that simply being put into a box and in which around 8 out of 9 people (actually more than this given the illusory superiority bias) are going to be told they're not as good as they think they are. Anyway, it's now something I'm going to be talking quite a bit about in my upcoming talent management talks in Saudi Arabia and Cyprus. By the way, although this is a new idea for me, other people have probably already thought of it, and it does actually simply reflect what I know a number of organisations are already doing. But I'd be interested in your thoughts and comments too!